La Baule is a very famous sea-side resort on the western coast of France, about 60km west of Nantes. The beach is considered by its inhabitants as the most beautiful in Europe. One thing is sure: this 8km beach is the longest in France. However, few people actually know that this spot was used as a race track some 70 years ago. On this beach some of the best pre-war drivers at the wheel of their single-seaters competed in a very special sand race. Some say that the idea occurred to GIs settled in Brittany just after World War I. They introduced the idea of racing on the beach as they used to do at home. I do not know if it is true but whatever the genesis of this race the Automobile Club de l'Ouest organized La Baule GPs from 1924 onwards, with the help of the municipality and French newspaper Le Matin. The first winner was Maurice Benoist at the wheel of an EHP-Ruby. The race became more and more popular. It would always take place in summer when people were on holiday in the Breton resort. This is surely a main reason of its incredible success: officially there were 200,000 spectators in 1938! There were nine La Baule "sandy" GPs from 1924 to 1933 (here Phi-Phi Etancelin is seen in 1929), except in 1930. From 1934 to 1937, the beach was much more quiet in summer as no race was organized. But, in 1938, on August 28, the single-seaters were back! For the very last time La Baule inhabitants could see, at last, some star drivers fighting at the wheel of voiturettes (the equivalent of the current F3000, oh sorry, GP2 Series…) on their own beach. And, as for the previous years, the organizers succeeded in creating a big event and for various reasons. The first factor of success was the track itself. This one was neither interesting nor impressive: two 1500-meter straight lines linked by two hairpins, on which drivers could not exceed 60 kph. The track was delimited by white and black wood sticks. The race went clockwise: the start line was in the middle of the straight line, few meters off the current Boulevard Hennecart. The pits were just after the Hermitage Bend, on the western side of the circuit. The name of this bend came from the Hermitage hotel, which was facing the hairpin, on the current Lucien Barrière Esplanade. The planned length of the race was 150 km, to be covered in 50 laps. Yet the only interest of this track was, of course, the sand. It was certainly not easy to drive on such a surface. Moreover, the organization of a beach race meant that it was absolutely necessary to take the tide into account. The Atlantic Ocean is not the Mediterranean sea. The tide ebbs and flows very far and quickly. So organizers had to study the tide sheet and the winds carefully. Charles Faroux, the famous French journalist and race manager, decided to give the start between 1:00pm and 1:30pm. As we are going to see later, it proved to be a mistake. However, the track on the beach showed two major advantages according to the organizers: firstly the tribunes, located on the sea walk, at some height off the beach, made it possible for the spectators to view the whole circuit, and not just a few bends like at any usual track. Secondly, the chances for the competitors to crash were considered null. No barriers were installed as there was nothing around… except some fare-dodgers who were standing on the beach because they did not want to pay the equivalent of €12,75 or €4,25 for a seat in the tribunes (ACO members and children below 10 paid half-price). The second reason of success of this 1938 GP was the location. La Baule was very trendy in the 30s. 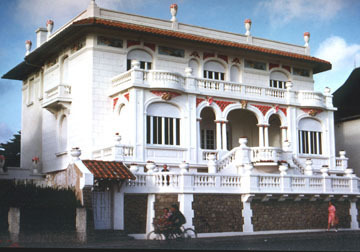 It offered a whole range of entertainment facilities: a very long beach, a casino, a theatre, beautiful villas – such as Ker Souveraine which is closely linked to Lucien Rosengart – and wealthy people. A kind of little Monaco… Moreover, during the week of the Grand Prix other events were organized: tennis and polo games for example. One of these events was the Concours d’élégance for cars, which was the second most important in France, after the Bagatelle contest, in Paris. This exhibition took place in the garden of La Baule Tennis-Club and spectators were able to admire beautiful women in wonderful dresses at the wheel of fabulous cars! The Prix d’excellence was granted to Mrs Wino-Postry’s Delage 16hp designed by Letourneur & Marchand and to Mrs Oliff-Lee’s Bentley 30hp. Francis Guérin (Bugatti n°9), described by the newspapers as a driver who used to race in La Baule. There is another Guérin in La Baule GP records, but with another christian name. Is he the same person? Jean-Pierre Wimille hoped to take part in the race at the wheel of an Alfa Romeo, but the Italian team had not planned to go to La Baule. To incite drivers to race the organizers had to give them premiums, like in any other race in the world. Thus racers were granted FF 100,000 (€42,500) plus FF 1,000 (€425) for each leader of the 10th, 20th, 30th, 40th and 50th laps. The winner of the 1100cc category was awarded the La Baule Casino Cup. Moreover this race was to be the last of the French championship, which was another good reason – mainly for Dreyfus and Trémoulet, to come to Brittany. Now, the race: it started at 1:15pm under a grey sky. Fortunately it only rained after the race. As seen above, eleven drivers out of fourteen were on the starting grid. So, when the flag came down, Dreyfus, the poleman, was immediately well ahead, followed by Hugh, Berg, Corsi and Delorme and the six other drivers. But, three laps later, Hugh and Berg overtook Dreyfus who went to the pits because of technical trouble. The race was done. Hugh was much faster than the others: he finished one lap ahead of Berg and three laps ahead of Delorme. So, despite the retirements of Dreyfus, on lap 14, and of Trémoulet the ranking did not much change until the end of the race. Save Corsi who did not appear in the top six while being third on the first lap. The 1100cc category was won by Maurice Mestivier and his Amilcar followed by Amédée Gordini, allowing him to take the La Baule Casino Cup home. As for René Dreyfus, he became the 1938 Champion of France, in spite of his retirement. 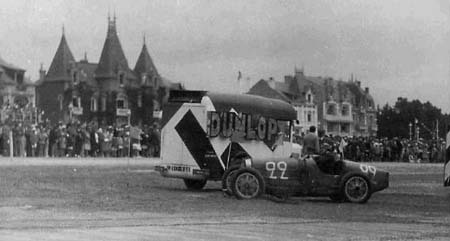 The only incident happened on lap 37, when Charles Faroux raised three fingers to inform drivers he had to put an end to the race on lap 40, instead of lap 50. Indeed, the tide was coming higher than initially planned. People who were watching the race from the beach now had their feet in the sea and had to leave. Parts of the sand track were getting wet.It was really time to stop. This is how the “sandy” era of the La Baule GPs ended. In 1939 another race was planned on September 3rd. Of course, the world had other things to deal with on this day and the race was cancelled. This “non-race” is also linked to the death of Jean Bugatti, Ettore’s son and the heir of the Bugatti company. He was testing the Bugatti T57C which won at Le Mans in order to enter it for La Baule, driving at a speed of 225 km/h when he tried to avoid a cyclist. He left the road, had a bad crash and died. It was August 11th.